The River Campus of University School of Nashville consists of about 80 acres of land situated on a 100-year flood plain at the confluence of Whites Creek and the Cumberland River. This land, which was previously used for raising cattle and harvesting hay, houses USN's athletic fields (soccer, lacrosse, baseball, softball and track) and includes 15 acres of wetland. 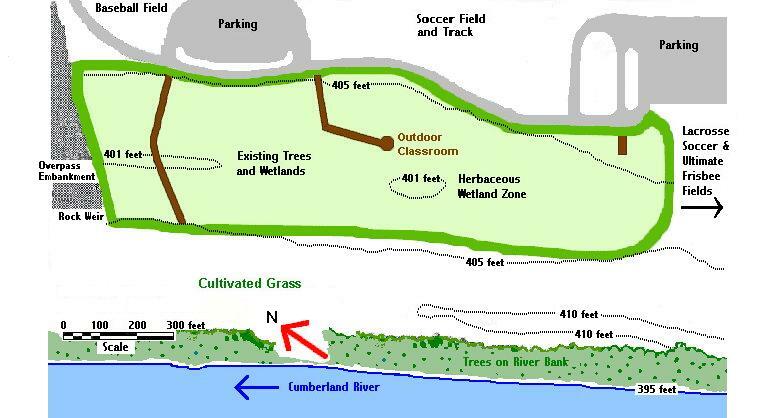 The wetland area consists of 8½ acres of marsh and hardwood with a contiguous 6½ acres (towards the south end) created at the end of 1998 as mitigation for lower quality seasonal wetland impacted by construction of athletic fields. As part of the mitigation, planting of wetland species was carried out in the spring of 1999. In the fall of 2001, boardwalks were erected (mostly by volunteers) in order to make the wetland area accessible to more people and to protect the vegetation from being trodden down. Studies of various aspects of the wetland area are being incorporated into the curriculum and we aim to have all grades from Kindergarten onwards participating in wetland related activities. A wetland is an area where the ecology is determined by the presence of water above or near the surface of the soil for prolonged periods of time. The presence of water results in the soil being low in oxygen and as it becomes reduced this hydric soil has a characteristic color and texture. 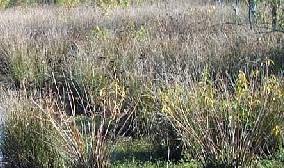 The specialized plants that grow under these conditions, such as the round reed or Juncus, are known as hydrophytes. There are many animals and plants which are characteristic of wetlands. 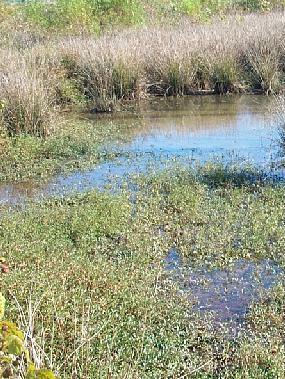 USN’s wetland is palustrine (forested broad leaved deciduous seasonal type or PFOIC). 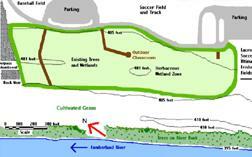 The wetland area is a depression lying in a 100-year flood plain (see News and Events section) and is isolated from any water source. It derives its water from direct precipitation and from run-off, the latter being increased by watering of the athletic fields. Water is retained by the poorly draining soil. The soil in the wetland area is Newark, Beason and Lindell silt loam (low chromas with bright mottles); in the surrounding higher land it is Arrington silt loam.